Posted on January 4, 2018 by Elizabeth Underhill. 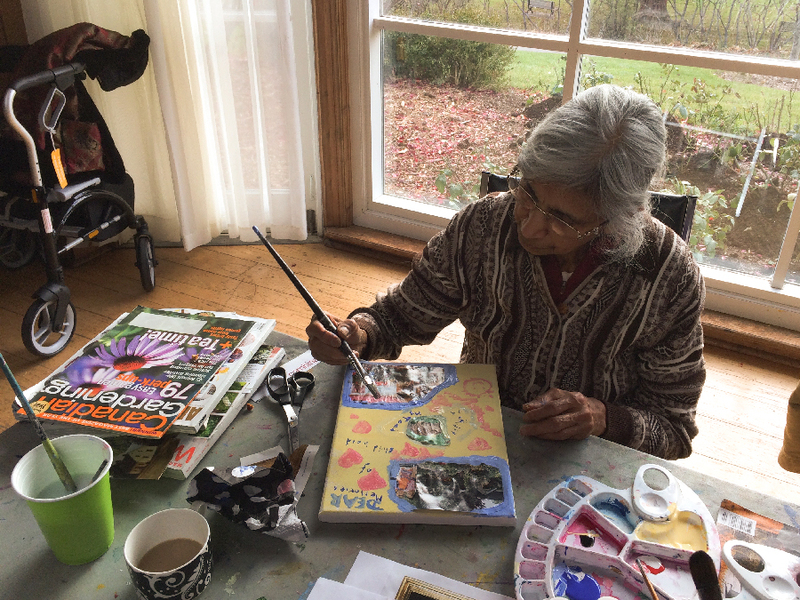 Late last fall, Oakville Galleries initiated Seniors Studio Connection, a series of hands-on art workshops for seniors of varying abilities, including those living with physical or cognitive impairments. As a way of making the program accessible, several workshops include free bussing from local seniors residences to the Galleries and back. It seems fitting that participants travel together for the program, since the art we discuss and make frequently evokes stories about the places we’ve been and where we’d like to go. Participants at one recent workshop made collages loosely exploring that topic: one woman created a red carpet scene set in Paris with an invigorating wash of blue sky in the background, while another assembled her dream garden with a bench to soak it all in, hemming her scene in a pink painted border. Anecdotes, aspirations and artistic advice abounded—including on the bus ride home—reminding us that some journeys are best taken with others. The next workshop is January 26 in Gairloch Gardens. For more information, visit our website.